Brent Council has launched a new schools-based dental outreach programme to help tackle tooth decay amongst local children. Nearly half of all Brent Children suffer with tooth decay and it is the commonest cause of non-urgent admission to hospital for children in the borough. The programme aims to work with local dentists and primary schools to arrange free dental assessments and fluoride varnish application to children in nursery and up to Year 2. The programme aims to provide free assessments to over 1000 children. Tooth decay is entirely preventable and this project will emphasise the need for regular brushing; avoiding sugary snacks and drinks and the importance of regular dentist visits for children over the age of 1. The scheme demonstrates real partnership working between the Council, local schools and the NHS to work together to tackle this important issue. We are currently liaising with head teachers over the summer months to identify which schools want to take part in this exciting pilot. Our work here follows on from the increased profile we are hoping to promote on this issue, symbolised by the recent Brent Magazine front page. 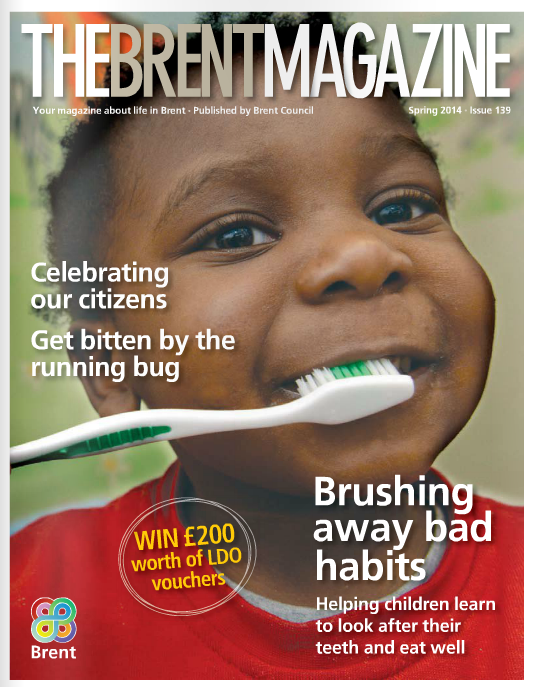 Posted on July 10, 2014 July 9, 2014 by Cllr Krupesh HiraniPosted in Brent, Health, Young PeopleTagged brent dentists, Brent Magazine, Children’s Oral Health, NHS Brent, Tooth Decay.